Several models are available and dimensions of 38-56 cm in height and width 35 to 54cm. 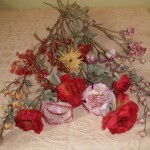 You will find some pictures as attachments such bouquets and do not hesitate to contact us to ask precise listing. For inquiries, please contact the sales department at 02466555 30 or by e-mail: contact@grossiste-bazar-solderie.com to receive photos and detail.